HOLLYWOOD – The trailer for Lando: A Star Wars Story dropped during the NFL Super Bowl and it featured a surprise. 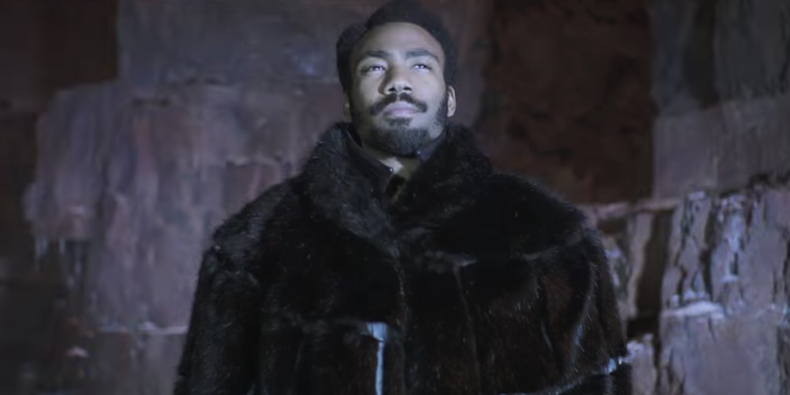 The new Star Wars Story – featuring Donald Glover as Lando Calrissian – just dropped its first teaser trailer and there was a surprise for fans. A brief appearance of Han Solo. Don’t get too excited it wasn’t Harrison Ford. But rather Alden Ehrenreich. The film is directed by the team who brought you Cloudy with Meatballs and The Lego Movie Far and Away and The DaVinci Code and tells the story of how Childish Gambino became the most legendary smuggler and gambler in the galaxy. The film also stars Daenerys Targaryen and Woody from Cheers. The appearance of a slightly younger Han Solo than the Han Solo that appears in New Hope sparked speculation that there might be a stand alone Solo Story in the offing. A rumor that Kathleen Kennedy quickly snuffed. There will be no stand alone Han Solo movie. Everyone knows that Han Solo is a side show to the more interesting stuff about Skywalkers and Jedis. Plus there’s no actor who could sustain a full length movie playing the iconic role which Harrison Ford created. Lando: A Star Wars Story will be released in the Summer.